WhatsApp bring new update beta version for his WhatsApp users. After enroll your WhatsApp account with beta tester you can activate WhatsApp Unsend and Live location sharing feature at your Smartphone. WhatsApp constantly bring latest additional features for his users. Due to these latest feature day by day number of WhatsApp users has been increased. Before few days ago Before few days ago WhatsApp brings latest photo and video status for his users which is activated only for 24 hours. Now, WhatsApp brings two latest unsend and live location sharing feature for his users. must remember this feature works within 5 minutes only of sending the messages. The second live location sharing feature allows you to quickly share your exact location with your friends or family members. After sharing your location your friends, family members easily track your location and reach the exact location. You can get the benefit for both latest feature at your Smartphone but, you must need to enroll with WhatsApp beta version. If you want to activate WhatsApp Unsend and Live location sharing feature at your phone, then you must know the process how to enroll with WhatsApp beta version. To do this job you must have to take following given steps, have a look. Step 1: Go to the the given link. Step 2: Tap on the BECOME A TESTER button. As you click on this button you became a beta tester. Step 1: First you must ensure that you have an rooted Android phone which is running on Android 6.0 marshmallow. Your device have to be root and must need to install Xposed framework. Step 2: If you already access the custom ROM and root access then you have to download and install Xposed framwork. Step 3: Now, give the root permission to this app. After that restart your device. Step 4: Download and install WA Tweaks app in xposed installer app at your device. After finish the installation open the WA Tweaks app and give the root permission. Now reboot your device. Step 5: Open the home screen of WA Tweaks and enable “Live location” and “Revoke option” . Now, After that tap on the Xposed Tweaks > Hidden features > Again turn on following options to finish this process. Step 1: First select the group or particular person in which you send the message. Step 2: Send any test message. Now you can recall the sended message within the 5 minutes of sending the messages. After that you are not able use Unsend feature. Step 3: Tap and hold the message which you want to recall. Now, tap on the three vertical dots which is located at top right corner of your WhatsApp window. Tap on the Unsend option. Note: If you have beta version of WhatsApp along with install WA Tweaks and Xposed framework at your device then you can use this feature at your phone. 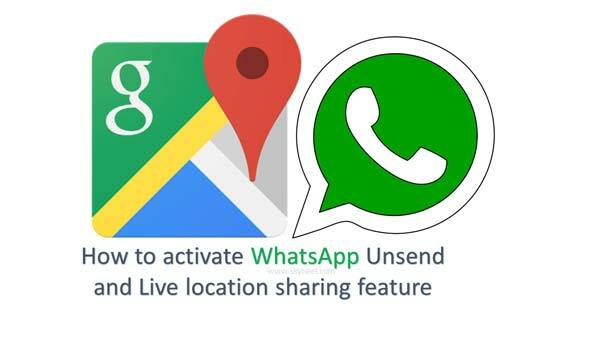 I hope after reading this guide you can easily activate WhatsApp unsend and live location sharing feature at your Smartphone. You must have to use this feature at your device. If you have any suggestion regarding this guide then please write us via comment box. Thanks to all.